The Jura Capresso ENA automatic coffee centers are the slimmest yet, less than 9 ½ inches wide. Offering super easy bean to cup functionality. The Jura Capresso ENA features a professional grade coffee grinder to provide outstanding crema coffee, espresso, cappuccino and latte. Grinds, tamps, brews, serves and self cleans in less than 60 seconds. It’s like having a coffee Barista of your very own! Each cup of coffee is made on demand. All you have to do is press a button! Coffee is ground for each cup just before brewing, preserving more aroma than any other brewing system. A technological breakthrough in the espresso and coffee world, super automatic espresso machines can make a wide variety of specialty coffee drinks at the press of a button. While espresso is the most common type of pressure brewed coffee, super automatic espresso coffee machines can also be used to easily prepare cappuccino, cafe latte and crema coffee. Crema Coffee is the strength of a traditional cup of coffee, but far superior. Pressure brewing quickly extracts the most flavorful aspects of the coffee while minimizing bitter and other un-wanted flavors. With the built in burr coffee grinder, each cup is brewed fresh with the coffee ground just a second or two before brewing. 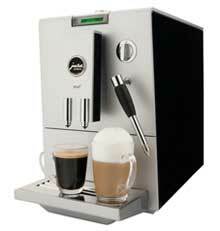 Super Automatic espresso coffee centers allow you to bring the coffee house experience into your kitchen.